Meanwhile, Kylian Mbappe was whistled throughout by the home fans. PARIS-SAINT GERMAIN pulled further clear in the Ligue 1 title race with an ominous 2-1 win over Monaco, despite Kylian Mbappe’s difficulties on his return to Stade Louis II. Edinson Cavani and Neymar scored either side of half-time as Unai Emery’s men rocketed nine points clear at the top of the table. Mbappe – whistled throughout by the home fans – was in a forgiving mood, the teenager incredibly wasting four clear-cut chances before he inadvertently deflected in a late consolation for the hosts. Cavani was less generous in the first half as he spared his team-mate’s blushes by stabbing in the opener inside 20 minutes. Mbappe’s ongoing profligacy plagued PSG after the restart but it ultimately proved inconsequential to the result, which Neymar sealed by winning and scoring a penalty. Monaco, who for much of the match looked incapable of mounting a fightback, did gain hope when Joao Moutinho’s free-kick deflected off Mbappe to cut the deficit, but it was not enough to prevent the champions from falling further off the pace. Email “Cavani and Neymar on target as PSG go nine points clear in Ligue 1”. 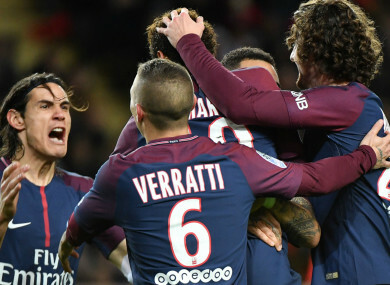 Feedback on “Cavani and Neymar on target as PSG go nine points clear in Ligue 1”.